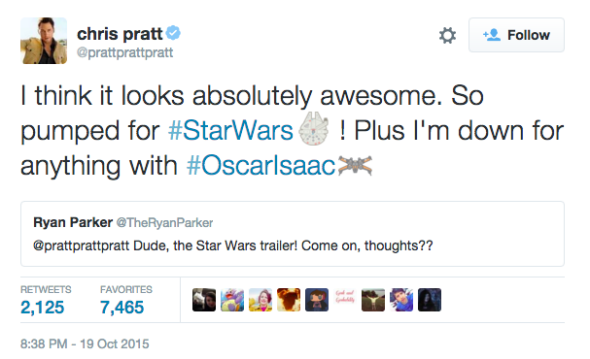 Twitter is inserting Star Wars emojis into people's tweets. If you grew up with Star Wars—and, really, who born after 1977 didn’t?—it’s hard not to get excited about the trailer for the latest installment. Like many others, I watched it when it premiered during the halftime of Monday night’s Giants-Eagles game. And also like many others, I almost immediately hopped on Twitter to share my enthusiasm, accompanying my brief note with the first hashtag the site suggested, #StarWarsTheForceAwakens. That’s when things got a little strange. Unexpectedly, Twitter appended to the hashtag in my tweet a custom emoji, the head of the adorable droid BB-8, who makes a brief appearance in the trailer. Quick investigation reveals that other hashtags yield similar results. As this Chris Pratt tweet reveals, for example, #StarWars summons up a tiny Millennium Falcon, and #OscarIsaac an X-wing. Many other actors—and some of the characters they play—are similarly flagged. Even director J.J. Abrams gets a tiny tie fighter. From a certain perspective, these little icons are harmless, even charming. In theory, they simply serve to underscore our collective joy at this forthcoming blockbuster. Amplifications rather than additions, they’re like exclamation points. But there’s something invasive and slightly crass about Twitter’s unsolicited inclusion of these emojis. This isn’t the first time that Twitter has experimented with custom Star Wars icons. When the company introduced an earlier set in April, it explained via its official blog that it had created the graphics in collaboration with Disney and Lucasfilm. But this latest set of emojis is an even more overt intrusion of commerce into fan culture. On Twitter, hashtags ordinarily serve to connect individual users with larger conversations, conversations that ostensibly emerge organically. Here, however, that conversation is unambiguously being manufactured and manipulated. By attaching these emojis to our messages, Twitter and its partners are encouraging users to talk in certain ways about certain things. While we’d likely be discussing Star Wars anyway, these emojis direct the flow of that conversation. Still, there’s something disquieting about the ease with which they’ve inserted corporate messaging into fan commentary. Ultimately, of course, it just makes explicit what we’re all already doing when we tweet about Star Wars: contributing free advertising to a multibillion-dollar franchise owned by a gargantuan multinational.